Walt Disney passed away in late 1966 and his older brother Roy O. Disney took over as the leader of Walt Disney Productions. While Walt may have been gone, all of the people that had worked with him for many years were still there. They continued doing their jobs the way they had before, the only difference being that Walt wasn't there to lend his uncanny expertise for what audiences would want to see. Sometimes the team was right on the money, which thankfully is the case with their first film without Walt's guidance. Bill Walsh and Don DaGradi, who wrote the screenplay for Mary Poppins, adapted a book by Ben Stahl about two teenagers who set the ghost of the famed pirate Blackbeard free into a Disney-style comedy. The most prolific director at the studio, Robert Stevenson, took on directorial duties. Dean Jones and Suzanne Pleshette were reunited to star in it after winning over audiences together in The Ugly Dachshund. Dean Jones was by now one of the biggest names with a contract at Disney. Academy Award winner Peter Ustinov was cast as the titular drunken pirate, his first of several Disney films. Elsa Lancaster is another staple Disney actress playing the head of Blackbeard's Inn. The film begins with a prologue about the death of the feared pirate Blackbeard, followed by credits set against footage of rolling waves along the shore. Steve Walker drives into the town of Godolphin where he checks in to Blackbeard's Inn. He just took a job as track coach for Godolphin's lackluster college team. When he arrives, the ladies who run the Inn are having a Bazaar to raise money to save the Inn from a buyout. In an effort to outdo the competitive football coach, Steve buys a bedwarmer that belonged to Blackbeard's 10th wife. As gratitude, the women who run the Inn put Steve in Blackbeard's old room and explain that his last wife was a witch and had cursed him to be a ghost until he could show a sign of "human goodness." When Steve accidentally breaks open the bedwarmer, he finds a spell book. After reciting a spell, Steve is able to see and hear the ghost of Blackbeard. The two are about as incompatible as possible, Steve being a mild-mannered man who doesn't drink, Blackbeard being a selfish pirate who can't stand being sober. While taking a drive to clear his head, Blackbeard gets him pulled over and due to the open bottle of rum in the car and Blackbeard's antics, he gets arrested. Steve begs him to give the ladies at the Inn his treasure to save it, but he is reluctant. After being set free, he meets his hopeless track team and Blackbeard offers to help train them, since he has experience training a crew and he thinks their success can somehow help the Inn. While on a date with Jo Anne, who is helping the ladies fundraise, Steve tells her what happened. Meanwhile Blackbeard steals her fundraising money and bets it on Godalphin winning the track meet. During the meet, Blackbeard helps the team and hinders their competitors, despite Steve begging him to stop. When the issuer of the bet cancels, he offers to let them play roulette with their original money instead. With Blackbeard's assistance, they win enough to save the Inn and fight off the casino goons. At the party to burn the mortgage papers, Steve has everyone recite the incantation so they can see and thank Blackbeard. Having proved that he can do a selfless deed, Blackbeard is free to sail into the next world. 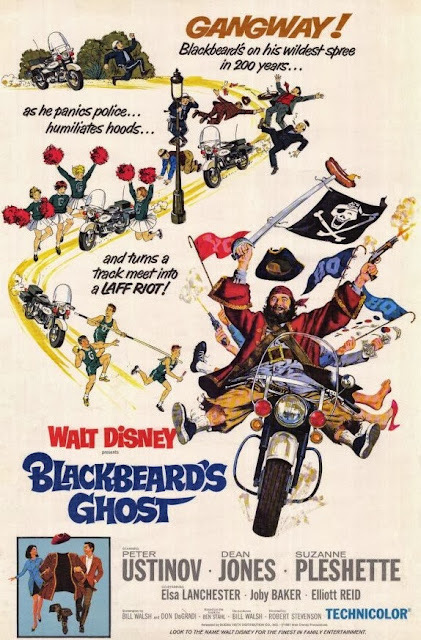 Blackbeard's Ghost premiered on February 8th, 1968. It was a critical and box office smash, ranking in $21 million in it's initial theatrical run. Its initial success earned it a theatrical rerelease in 1976. It made its TV debut in 1982 and was released on video for the first time that same year. Despite the initial success of Blackbeard's Ghost, it has faded into obscurity over time. It is a thoroughly enjoyable film with top notch performances, interesting characters, cool special effects, and some genuinely funny moments. The problem is that its best moments can be found in better films. The zany track meet feels directly inspired by The Absent-Minded Professor. Dean Jones and Suzanne Pleshette have wonderful chemistry, which can also be seen in the more original The Ugly Dachshund. And the special effects that make this film standout were recreated to better affect years later in Pete's Dragon. None of this detracts from the entertainment value of the film itself, but seem to be the cause for why this film isn't widely known today. Blackbeard's Ghost is currently available on DVD, where it is presented in pan & scan fullscreen. The film was originally released in a widescreen aspect ratio of 1.75:1. The DVD also shows a lot of dust on the film. There aren't any bonus features. A more recent restoration was done and that version can be found on iTunes in widescreen, where it is also available in HD. i have see it be for.i order online Jan 2,2019 my son never have seen it.so i buy.